Let’s find your Bra Size Starting Points! This guide will show you a simple way to calculate your bra size starting points. 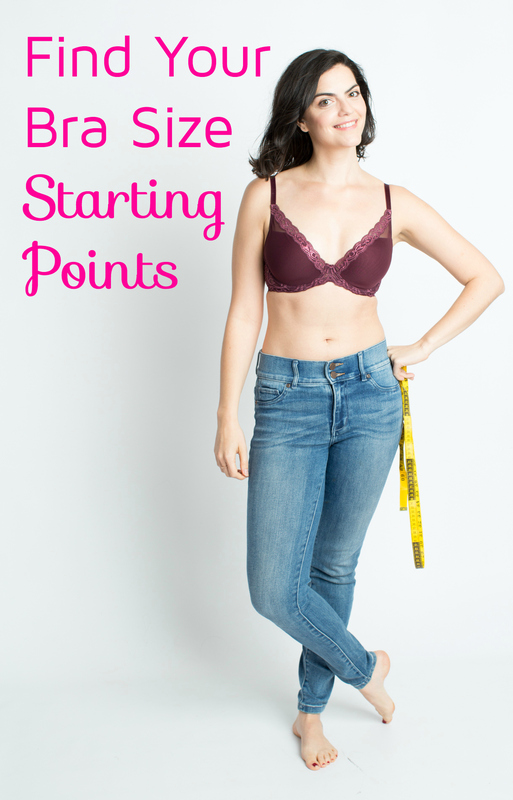 I say “starting points” because your bust and underbust measurements will give you an approximate idea of your current bra size. Numbers are information, not a definition. And because every bra fits differently, women’s bodies fluctuate, and brands size their bras using various methods, there is no one standard or scientific way to calculate your exact bra size. My hope is that by measuring yourself and calculating your bra size starting points, you’ll be one step closer to saying hurray! Use these starting points to make an informed purchase online, to choose bras to try on at your local shop, or even to stay in the know when working with a bra fitter. After using the simple guide below, I’ve shared a few of my favorite resources for you to use these bra size starting points. From a guide on how to tell if your bra fits, to learning how bra sizing works across the globe. PS: Check out the More Than My Numbers project to see what bra sizes other women wear! Are you ready to find your bra size starting points? Bring the measuring tape around your torso where your bust is the fullest. Keep it straight, and level with the floor. Do not squeeze too tight or keep it too loose. Keep the tape nice and taught. Record your measurement in inches, rounding to the nearest half inch. Bring the measuring tape around your torso just underneath your bust. US band sizes run in even sizes. Using your Underbust measurement, add 0 inches to 1 inch to get the closest even number. Ex: If a woman’s Underbust is 29″, an odd number, she would add 1 inch to get 30. Using the English alphabet, find your cup size, using each letter for a number. 1 = A, 2 = B, etc. Ex: A woman’s cup size calculation is 3, so 1(A), 2(B), 3(C). Ex: Her first bra size starting point is 30C. Next, find your second starting point size (or your “sister size“) by going up one band size, and down one cup size. Ex: A woman’s bra size 30C. Her second size is one band size up, 32, and one cup size down, B.
Ex: That means her second bra size starting point is 32B. You’ve got your bra size starting points. Now what? Use these resources to say hurray for lingerie! Download my video and PDF guide and learn how to tell if your bra fits! Use this guide when deciding between sizes, trying on bras at home, or while out shopping. Learn what “sister sizing” is and how it works so you can adjust your bra size and find the best fit for you. Did you know more than one bra size can fit? In fact, 9 fit me! Learn why this is (plus photo examples) and get links to my bra sizing guides and resources. Explore my favorite lingerie and bra fitting resources! From articles, posts, and tools to shopping information and style advice. Everything you need say hurray underneath. It’s common to think “I can’t possibly wear that size!” Brave women are stepping up to share their measurements and bra sizes to give you an idea of “what a size can look like”. Erase the fear and worry around your numbers – including your bra size. See what they wear, and join us. Learn more about the #MoreThanMyNumbers project.